The chronological collection isn’t comprehensive by any means—there were no kinescope recordings made of his earliest shows and copies of others have been lost (destroyed actually, like so much of the early TV record, to clear out the “clutter” of the network archives)—and Kovacs was so prolific that such a project would be daunting even if the material was available. 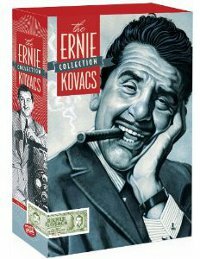 But there are surviving clips of some of his earliest shows and complete kinescope recordings of key programs, such as his NBC morning program The Ernie Kovacs Show (1955-1956) and his evening show by same name, a variety show that was a summer replacement for Sid Caesar in 1956. (Some of the programs have had the musical performance edited out due to the cost of music clearances but the Kovacs portions are intact.) And while he resurrects familiar characters (Percy Dovetonsils, the martini-swilling poet laureate of bad verse) and recurring skits (the simian orchestra The Nairobi Trio in all its incarnations), much of the comedy is designed for the TV audience rather than a studio audience, such as a marvelous “ghost dance” where chroma-key video figures are superimposed to interact with a live performer. Again, the technology is primitive but the execution is quite graceful, at times lovely and all the more impressive for accomplishing the intricate interaction and effects live. Even the fabulous credits, delightful bits of visual experimentation created live for his own amusement. Saturday Color Carnival: The Ernie Kovacs Show, from January 19, 1957, is the sole color broadcast from the collection and the first piece of pure Kovacs creation. Dubbed “The Silent Show,” it is a half-hour comedy special featuring his character Eugene navigating a world of visual gags, sound effects and music, performed (apart from his spoken introduction to the audience) entirely without dialogue. It was essentially remade as “Eugene” in his run of monthly ABC specials (1961-1962), the shows that PBS resurrected in the seventies and revealed Kovacs as a master of the medium. The eight half-hour productions (five of which are on the set) were shot and edited on videotape for broadcast rather than produced live and Kovacs embraces the opportunities of the studio-shot production to shape everything the program from start to finish as a comic symphony. Rapid-fire gags are cut between odd conceptual pieces and snatches of classical music become the soundtrack to odd, unspoken stories that magnify the mundane into epic dramas of operatic dimensions, like a surreal live TV “Fantasia.” Here is where the conceptual creativity and technical ingenuity meets the visual grace and dramatic power of visionary filmmaking for the small screen. He turns cigar commercials into high concept comedy pieces (he won a Clio award for one of them) and even the credits are strange and wonderful creations filled out with cartoonish gags and droll visual commentary, especially in the final special, which was broadcast commercial free in honor of Kovacs’ after his untimely death at the age of 42. Fifty years later there is still nothing like it. The technical quality of the episodes and clips caries according to source. Most are kinescope recordings (16mm films shot directly from a TV screen) and look as good as can be expected and the videotaped programs look better than expected, thanks to the preservation efforts of Kovacs’ widow and partner in conceptual comic mayhem Edie Adams. Supplements include skit highlights (including more Percy Dovetonsils), rare behind-the-scenes footage and a reel of his brilliant Dutch Masters Cigar commercials, along with other bonus material. An accompanying booklet offers essays and appreciations (including one by author Jonathan Lethem) plus notes on the programs and the source material of the master recordings. Matt Zoller Seitz offers an appreciation of Kovacs at Salon here and is especially taken with Kovacs as host and performer. The final Ernie Kovacs broadcast ended with a reprise of the most famous of the Nairobi Trio bits, so I’ve reprised once again below.